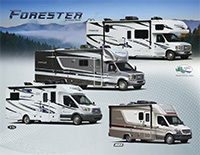 Forester Class C motorhomes offer comfortable floorplans with spacious interior living, well-appointed décors, and several slide-out floorplan options. Plus, all Foresters are “Certified Green” by TRA Certification. With 14 floor plans and 3 chassis platforms, you’ll have no problem finding the perfect motorhome to suit your camping style. GCWR (Gross Combined Weight Rating) – is the maximum permissible loaded weight of your motor home and any towed trailer or towed vehicle. Actual GCWR of this vehicle may be limited by the sum of the GVWR and the installed hitch receiver maximum capacity rating; see hitch rating label for detail.